It's sharing time! Here are some recent finds. Well, I didn't find the corks. OK. I did. They were in bottles. I had to get them out of the bottles to make this pile. It was a lot of work, but someone had to do it! If you look in the background, you'll see my Sanford & Son driveway. Lots of stuff sitting around waiting for Warrenton. And how bout that chest? Several of you mentioned that you wanted me to brings lots of smalls to Warrenton. No worries! I am picking up some great smalls and I'll have lots of packing paper with me. If you have space in your suitcase/car/trailer, I will be right there to fill it up! 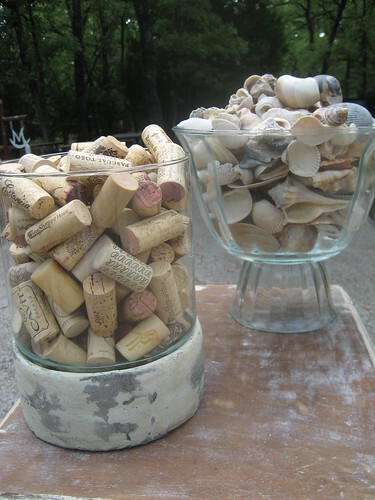 Let me know if you think you'll want more corks. I'm sure I can "find" more for ya! You'll be on the road to the show before you know it. Oooh, great stuff, Mindy! 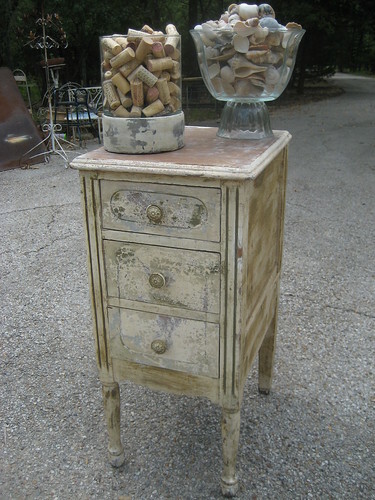 Love that little chest of drawers - do you think it will fit in my suitcase? Zita, is your suitcase a trunk? Cuz, we can fit the chest in a trunk, I'm sure! Can y'all believe I only have 4 more weekends to prepare before we leave! Eeeek! OK, Mindy, I need the measurements on that little chest of drawers. Oh, I likey! 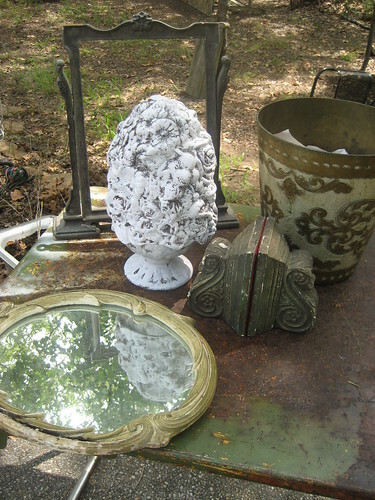 I remember your mirrors were what kept me coming back to your blog when I first met you online a year ago. Love the one you show here! And, yes, I would LOVE to visit you at Warrenton however I'm throwing a shindig for my husband's 40th on the 26th! I want you to make me some of that "slap your momma" salsa you spoke of on my blog, so a visit WILL be in order! Corks look way cooler than diet coke cans stacked! Hope you are getting lots done before you start packing, wish I was going to Warrenton. You're really gathering the goodies. I'm sure you'll do great down there. Can't wait to see it all. I enjoyed spending the weekend with you! We got a lot done! Hopefully, we'll be ready to roll out with the first load soon! Hi Mindy! Thank you so much for visiting my blog and leaving me such a kind note. So, you're one of the awesome Winnie & Tulula's people, eh? I can't wait to meet all of you at Warrenton. Wonderful blog you have here, so much talent! Mindy, I can't thank you enough for linking me to your post about how to survive at Warrenton. As I replied to you on my blog, when is the blog party? I think I might only be there one day (boo! darn heck!). I'm so glad that you and Theresa will be so close, she's another fave I'm dying to meet! Darn. No, Mindy, my suitcase is not a trunk, but it's quite big. Unfortunately just a couple of inches too small :) Hmmmm. Minday, another HUGE thank you for the extra info on Warrenton you gave me today. I'm crossing my fingers (and toes!) that we'll be able to stay more than one day. So much to see, so little money, LOL!